A true headwater is often not what you might expect. Before I knew better, I imagined a bolt of cold, clear water shooting from a stone slab near a summit and a stream leaping fully formed down the mountainside in loping steps of plunge pools and falls. It can be like that I guess, but more likely a stream begins as little more than a seep, a squeezing of water from the earth. It's wet moss and leaves, a soft spot that holds the print of my boot or the shallow press of a raccoon's foot equally well. It speaks more of salamanders and frogs than of trout and mayflies. A headwater can be and often is the quietest of births, nothing more than a few drops of water pulled forward by the gravity of a mountain slope, moving in fits and starts before gathering itself into any kind of flow that you might call a stream. A stream, well, it takes awhile. There is volume to be accumulated, earth moved, channels carved. There are paths to be determined. A stream, like anything of great value, requires work, grows slowly. Even then, you are only talking about the framework of the watercourse, the physical pieces. Water. Stone. Earth. It is of course more than this. It is an irreplaceable piece of the landscape, its plunging, gurgling currents the unique voice of the land through which it passes. A stream demands more than a simple description of its physical components. A name for instance. Any angler can tell you that. 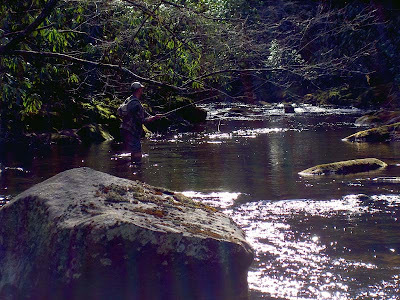 Mention the name of a favorite stretch of water to an angler and watch for the change in countenance. There is more than trout and water in the flood of thoughts that fill his mind when the name of this stream or that stream is said aloud. It's a far bigger picture. I see that with my own fishing partners, men with whom I have shared hundreds of hours astream. 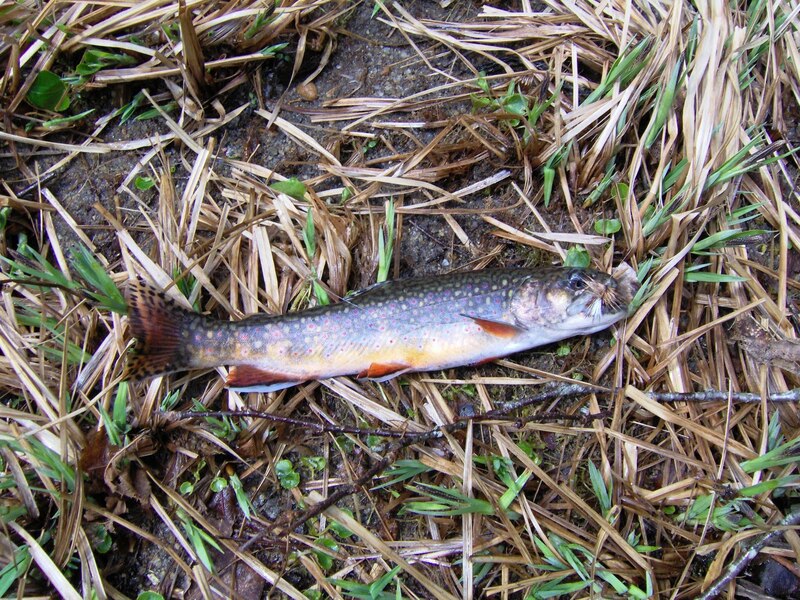 If I say Big Snowbird, for example, I can tell you that we will each think of brook trout and dry flies. We'll also think of the hidden campsite near Big Falls, the one with the large fallen oak, a tree that has served us well over these years as a bench, kitchen and even, on occasion, emergency shelter. We will all think of midnight hikes in the rain. 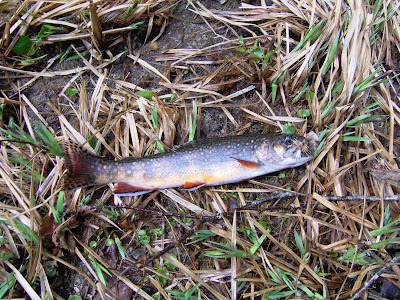 Or if I say Meadow Branch, our common thought will be of the legit 10 inch wild brookie that Geoff took with a textbook bow-and-arrow cast, shooting his Adams through a keyhole in a tangle of rhododendron and into a pool no bigger than a kitchen sink. Or maybe I'll say Abrams, and our minds will all turn to a sublime day of catching wild rainbows in the infamous Horseshoe section of this stream a few summers ago, and of Stephen's near-death experience after he stayed on the water just a bit too long after sundown. We'll think of the copperhead crossing the trail in the milky glow of Eric's headlamp. We'll think of being surrounded by a pack of howling coyotes at the trailhead as we unlimbered our rods in the dark. There are a thousand other such examples. A favorite trip? My guess is that none of us would be able to pin this down. The truth is our many days together, and they are countless, blend into a single trip that to a large degree defines our friendships and in many ways significant portions of our lives. Removed from their stony beds and embedded in our minds, these streams become tethers that continue to connect us. I am trying hard not to wax too philosophic, but I'm not sure it can be avoided. We are after all talking about more than a bit of water and a few trout here. Christopher Camuto writes in Another Country that the Cherokee indians believed that "no river or stream was inconsequential ...". 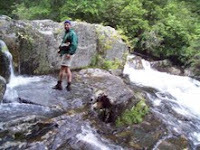 To the Cherokee, mountain streams in particular were "important seams in the world.". I'm not sure anything else needs to be said. I think the Cherokee got this exactly right. The question then is who gets it right today? Who carries forward this idea that streams and rivers are important and worthy of our stewardship? You will be hard-pressed to find a better answer to that question than Trout Unlimited. These are the people on the front lines of protecting these rivers and watersheds, but that is really only half of the story. They are the guardians of these "important seams" that connect us to each other and to the land itself. There's a bigger picture. They deserve our support so that those who come after us will say that we too believed that no stream was inconsequential. Very nicely done. Good luck in the contest! Enjoyed the post, and well said. That's some magical writing. Well done. Hey guys, thanks for reading! Very much appreciate your comments. This one brought back some good memories. Really nicely said...headwaters are what it's all about. good luck! Thanks Sanders! Good luck to you as well.